Today, Hayek’s ideas are part of larger dialogues in Japan, the United States, and elsewhere about the culture and politics of neoliberalism. These discussions have only become more urgent in the years since the global economic collapse of 2008. In particular, the question of whether neoliberal reason is the cause or the cure of our current economic and social strife has recently attracted the attention of scholars in fields ranging from political science and economics to history and anthropology. This essay aims to contribute to these discussions by thinking through the cultural dynamics of neoliberal reason from the perspective of modern Japanese literature. My analysis is premised on a concrete connection between the seemingly disparate fields of modern Japanese literature and Hayekian neoliberalism: In 1957, the most famous novel of modern Japan, Kokoro (1914) by Natsume Sōseki (1867–1916), was translated into English by Edwin McClellan (1925–2009), who was at the time one of Hayek’s advisees on the Committee on Social Thought at the University of Chicago. McClellan was born in Japan to a Japanese mother and a Scottish father, and he counted both Japanese and English as native languages. 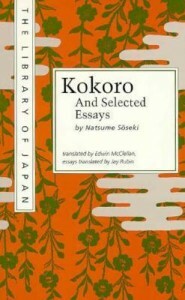 The novel he translated while working with Hayek, Kokoro, is a literary masterpiece that centers on the relationship between an alienated university student and an older man, known only as “Sensei” (my teacher), who shares his thoughts on the loneliness of the modern world with the student before committing suicide just after the death of the Meiji Emperor in 1912. McClellan’s translation of Kokoro deeply moved Hayek. In fact, McClellan’s literary rendering of Sōseki’s poetic prose so powerfully affected Hayek that he later hired McClellan to polish the language of his own writings, including such classics of neoliberal thought as The Constitution of Liberty and Law, Legislation and Liberty (3 volumes; published in 1973, 1976, and 1979). While moonlighting as an editor (of sorts) for Hayek, McClellan was better known as an influential professor of Japanese literature at Chicago and, later, Yale. During this time, his translation of Kokoro was probably the most widely assigned novel in courses on modern Japan taught in America. The prominence of the translation, though, can make us forget that it was actually undertaken at a time when the field of Japan studies in American academe did not yet exist, and by a graduate student who was trained by scholars who knew almost nothing about Japan. In the 1950s, after all, McClellan was studying with social scientists, philosophers, and economists affiliated with the Committee on Social Thought at Chicago—not Japanologists. In a 1956 letter of recommendation, in fact, Hayek described McClellan as a political scientist: “[McClellan] is an unusually cultivated man of wide interests and is now employing his good background in economic and political science for a study of certain very important intellectual trends in Japan—an aspect of the influence of Western ideas on the political developments in that country.” McClellan’s translation of Kokoro would go on to become standard reading for generations of students interested in modern Japan, but the point of departure for my own analysis is that it was originally composed and received within the context of a nascent neoliberal movement led by his advisor, Hayek. As a graduate student at the University of Chicago in the mid-1950s, Edwin McClellan (1925–2009) translated into English the most famous novel of modern Japan, Kokoro (1914), by Natsume Sōseki. This essay tells the story of how the translation emerged from and appealed to a nascent neoliberal movement that was led by Friedrich Hayek (1899–1992), the Austrian economist who had been McClellan’s dissertation advisor. BRIAN HURLEY will be joining the faculty of Syracuse University in the fall as an Assistant Professor of Japanese literature, film, and culture. His research has also appeared in the Journal of Japanese Studies and in the Japanese-language journal of literary criticism Bungaku. He is currently working on a book manuscript that examines the confluences of literature and thought in modern Japan.